Again, salute to Bing. After I already expressed my appreciation before to their great occasion blog posts that contribute to their connection with the webmaster community, yesterday Microsoft’s search engine team (Duane Forrester more specifically) posted another great post for webmasters about submitting contents to Bing. If you launched a new website, this might be the best way for INITIALLY submitting your site so it would be found and crawled. Simply enter the submit site page, put in the CAPTCHA (to prove you are human), type your domain and hit “Submit URL”. 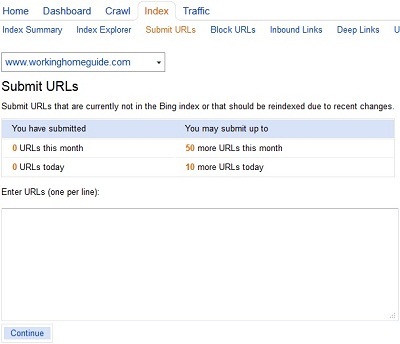 This is the simplest and fastest method to signal Bing it should start crawling your new site. This method is the best way to make sure that Bing will index your new page/post as quickly as possibly for your ALREADY INDEXED website. First, you obviously need to have a verified Bing Webmaster Tools account for your website. In your verified account under the “Index” tab, you will find the “Submit URLs” section. There, you can enter the URLs you wish to submit. Note that you are limited for 50 monthly URLs submissions and 10 daily URLs submissions (to avoid multiple submissions by spammers). This method should use whenever a website has been penalized by Bing for some reason (Malware, spamming) and the webmaster fixed the problem and he wants that Bing would reindex the site’s content. To do so, visit this Bing’s contact support form page, type you details, elaborate the reason why you contact Bing and ask to be reincluded in Bing index. This method is recommended to use AT ALL TIMES. Again, this is required you will have a verified Bing Webmaster Tools account for your site. In your account, under the “Crawl” tab and the “Sitemaps (XML, Atom, RSS)” section, you can submit your sitemap/feed URL.